"Little E" scored three victories -- two of them in Winston Cup points races -- but totaled only five top-10s the entire season. Amazingly, his 10th place finish at Dover in early June was his last top-10 of the season. In the second half of the season he had six finishes of 30th or worse, and by the time he figured out what had disrupted the smooth flow of success he experienced earlier in the year the season was over. Still, Earnhardt Jr.. became the second driver to score his first Winston Cup win at Texas Motor Speedway, with 1997 inaugural winner Jeff Burton; and also became the first rookie to win The Winston all star race at Lowe's Motor Speedway. With his victories and two Bud Poles, he qualified for 2001's two special events, the Budweiser Shootout at Daytona and The Winston. 1997 Gargoyles Monte Carlo Best finish of 7th. 1997 Sikkens (bl) Monte Carlo Only drove this car once. 1997 Sikkens (wh) Monte Carlo Only drove this car once. 1997 Wrangler Monte Carlo Best finish of 13th. 1999 Budweiser Monte Carlo 1st WC race. 2000 Budweiser Monte Carlo First full WC season. 2001 Budweiser Monte Carlo 2nd WC season. Earnhardt Jr.. began his professional driving career at the age of 17, competing in the Street Stock division at Concord (N.C.) Motorsport Park. His first race car was a 1978 Monte Carlo that he co-owned with Kerry. 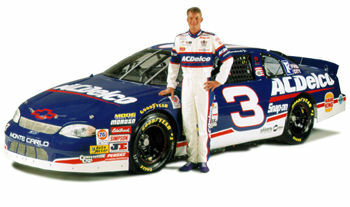 Within two seasons, the young Earnhardt had honed his driving abilities to the point of joining the Late Model Stock Car division, where he developed an in-depth knowledge of chassis setup and car preparation while at times racing against Kerry Earnhardt and their sister Kelley. With his father's guidance and his own experience on the short tracks throughout the Carolinas, he was ready to take a bold step forward. In his inaugural Busch Series event at Myrtle Beach, S.C., in 1996, Earnhardt Jr.. posted a seventh place starting position and a respectable 14th place finish. Dale Jr. joined the Busch Series full-time in 1998 with the ACDelco-sponsored car owned by Dale Earnhardt Inc. (DEI), gaining his first victory at the treacherous Texas Motor Speedway in April 1998. He dominated the Busch Series for two seasons -- winning 13 races. In Earnhardt's Busch Series career, he scored top-five finishes in nearly 50 percent of his starts. Dale Jr. joined the Winston Cup circuit after two years of dominating the NASCAR Busch Series with two championships. 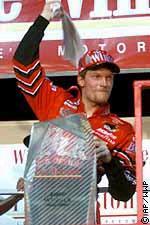 His first Busch Series race took place in 1996 at Myrtle Beach, S.C., and after grabbing his first victory at Texas Motor Speedway in April 1998, Dale Jr. added 12 more race wins to his Busch Series resume. Dale Jr. recorded his first Winston Cup top 10 finish at Richmond in September 1999, and first led a Winston Cup race at Atlanta in November. Favorite Actor: Cuba Gooding, Jr.